Grumble Monkey and the Department Store Elf Has Been Released and Already Has A Five Star Review! 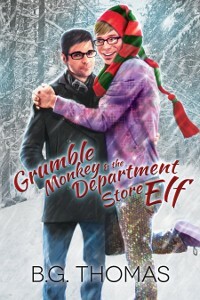 If ‘Grumble Monkey and the Department Store Elf’ is a typical example of the writing style of B.G. Thomas, then I will definitely be reading more of this author’s work. He has incorporated two of my favorite types of characters, the grumpy curmudgeon, and the young, flamboyantly gay man. He has mixed them together on Christmas Eve, stuck driving together in horrible snow and sleet conditions, and shaken them up a bit to see what comes of the mixing. Ahhhh, such fun! Nick is a thirty-two year old businessman. A rather uptight businessman, if you ask me. Nick is the kind of man who doesn’t go to gay pride events. Why should he? Straight people don’t have pride days. Ridiculous concept. He despises outlandishly gay men for perpetuating the stereotypes and people with silly nicknames. So when he meets Kit (short for Kitten, because his sister couldn’t pronounce Keaton), and he’s wearing a giant elf hat and rhinestones on his jeans, it’s a wonder Nick actually agrees to give him a ride since Kit’s car broke down. It’s sort of incredible what can happen when two different people are stuck in an adventure together. Kit starts to break down some of Nick’s reserves and Nick looks at Kit a whole lot differently. Interestingly enough, Nick and Kit have a very common ground. Art. Nick is an art dealer with a well known gallery in New York, and Kit is in his final classes at the Art Institute of Chicago. Fate? Kismet? It was funny to watch Nick realize that all these things he “professed” to hate, were really things his wealthy and standoffish parents had hated. Since they kicked Nick out at twenty-two for being gay, it didn’t matter what they thought or felt so why had he hobbled himself all these years? Kit reminded him of hope, of optimism, of joy, and of love. This is a great Christmas story. I enjoyed watching the dynamic between these two men and the changes they each brought to the other. A newfound peace within himself for Nick and a touch of maturity and confidence for Kit. Thank you, B.G., for great characters and a lovely story. DISCLAIMER: Books reviewed on this site were usually provided at no cost by the publisher or author. This book has been provided by Dreamspinnner Press for the purpose of a review. HUGS and TONS of HOLIDAY LOVE! This entry was posted in Uncategorized and tagged grumble monkey and the department store, on sale now!, reviews. Bookmark the permalink. ← Top 2 Bottom Reviews Gives “Anything Could Happen” Four and a Half Stars!